Applaws Cat Food Senior Chicken is formulated specifically for aging cats. The tasty and natural dry food does not only contain premium chicken, but also coconut oil. This has a beneficial effect on signs of aging. Applaws Senior is available in bags of 400 grams, 2 kg and 7.5 kg. Your cat’s nutritional needs change as it grows older. Applaws specifically developed this dry food for aging cats. The food contains dried chicken meat, potato and coconut oil. This oil has a beneficial effect on signs of aging. The salmon oil in this food is naturally rich in Omega 3 and 6 fatty acids. These nutrients contribute to the condition of the skin and coat. 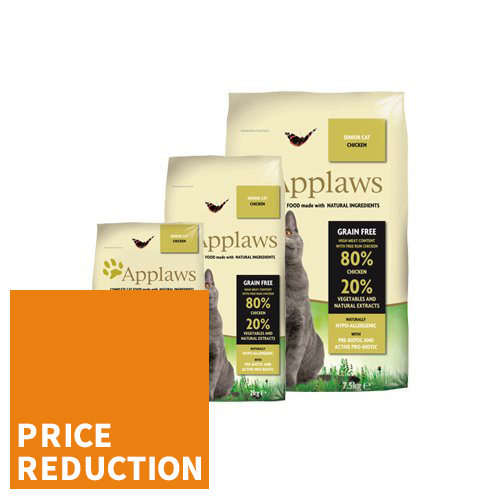 Applaws Adult is free from grains to prevent stress on the kidneys and liver of your adult cat and to reduce chances of food intolerance. The beneficial bacteria added to the food contribute to a balanced gut flora. Applaws Senior is available in bags of 400 grams, 2 kg and 7.5 kg. Dried chicken (67%), minced chicken (12%), potato, beet pulp, brewer’s yeast, chicken broth (1%), cellulose salmon fibres (0.5%), coconut oil (natural source of MCTs), vitamins and mineral, dried egg, sodium chloride, calcium carbonate, seaweed/kelp, blueberries, DL-methionine, potassium chloride, yucca extract, citrus extract, rosemary extract. Have you used Applaws Cat Food - Senior - Chicken before? Let us know what you think about this product.